I worked for Yumso Inc. after graduated from my undergrad study. 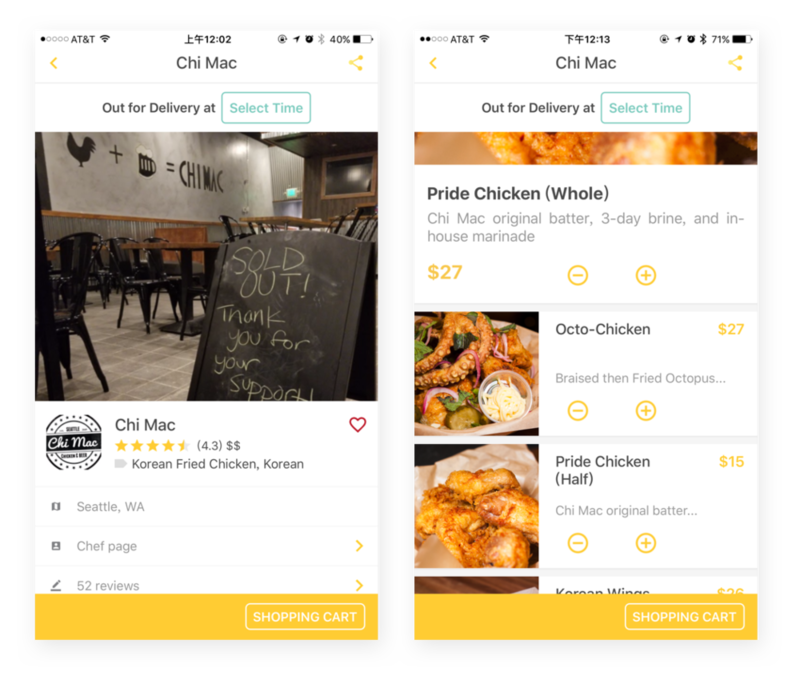 Yumso is a Seattle-based startup company that connects home chefs with local food lovers. It provides a platform for people who love cooking and sharing the taste of their home recipe with the community. And with the Yumso app (eater-end), users can order food and enjoy the taste of home which is delivered by our deliver crews. How does the Yumso App different from those food delivery apps? At Yumso, we promote home chefs compared to other food delivery apps that feature local restaurants. Because home chefs work in different patterns than restaurants, we need to coordinate our product to suit home chef's need. how should I shape my design in the app to align it to home chef’s working pattern? In reflecting these values back to our eater app, we decided to set “time” as part of the criteria during the ordering process because restaurants might have different business hours and supply different menu at different time. With the previous experience that people had with other food delivery apps, they expected that after entering an online restaurant, they would be able to view the menu and order food. When we introduce one more step (choose a time slot to view the menu) into the ordering process, people might have difficulty adapting to the new step. We needed to build up v1.0 quickly in order to test whether our approach works or not. Due to the constrains we were facing, we decide to make our v1.0 as MVP. V1 needed to be shipped as soon as possible. Started to collect feedback for our future product development. We ran Version 1 for 3 months to collect user feedbacks. During the time we also do mini updates to see if it fix some usability issue. Overall, Version served as a good foundation for the development for v2.0 (the completed version of our app!). After v1.0 launched on App Store, we kept iterating to improve user experience and collecting feedbacks from our early users. v2.0 is now on the app store. Pain Point: What happened in V1? One of the main problems exists is that users are having trouble to locate menu schedules and select a scheduled menu, which is essential for making an order because users would need to choose a scheduled menu in order to view the available dishes at their desire delivery time. Trouble Shooting: Why that Happened? Another issue with v1 is that when there was no schedule available, users weren't able to notice it when looking at the menu pictures (they wouldn't notice it until they tap "Select Time" and see there are no available schedule).